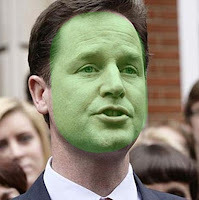 Well the 6 Nations were having a rest weekend, which clearly left plenty of energy for the Suitable Sentence for Clegg. No-one resorted to the obvious expedient of "you shall be taken from here to a place of lawful execution, where you shall have your privates strapped to a wind turbine etc etc" which is just as well because that's not allowed on blogs these days. The blasts from a well-remembered past were enjoyable: little green giant's granny's not as green as I'm cabbage looking; and Budgie's Heinz Kiosk reference. Pogo's proposal was right on the money as regards macro-economic analysis, if lacking somewhat in, errr, the green slogan department. And in 3rd place: Anon @7:18 with The winds of change will generate electricity that is too cheap to measure! This is so close to DECC's actual claims for the benefits of decarbonisation, I am left wondering whether Anon isn't Crapper Huhne himself. In 2nd: Steven L with Bigger lecy bills, or the Polar Bear get's it! Steven - if only your punctuation had been as good as your instinct for populist prose. But get's isn't a word. Sorry. Alan, you should be a regular at Mr Quango's weekly QT compo, you will quickly rise in the rankings! We look forward to a highly creative FIT, when you've invented the perpetual motion machine. Thanks - First time I've won a compo. We look forward to a highly creative FIT, when you've invented the perpetual motion machine. Bypass the solar panel and plug in the neighbours mains feed? now, what's the Tariff to be ? go for it ! A packet of seeds & a shovel. With so much BS you wouldn't even need fertilizer. I guess a better FIT would be the mineral rights to a hectare of Mars per kwh produced. Although its a bit like the top gear snowbine, the more you think about it the more sensible it sounds.